We would like to congratulate our Alumni and recent students who just wrapped the Miami unit on the set of Bad Boys 3. We enjoy seeing our students applying skills and techniques learned in the classroom professionally in the field. Bad Boys 3, tentatively titled ‘Bad Boys For Life’, was shooting in Miami over the last 2 weeks and will spend around $10 million by the end of their time shooting in South Florida. The movie is set to release in January of 2020. We’re so glad to see these movies filming here in Florida again. “Mind The Gap” Writer and Director Ilana Marks holds a local sold out premiere Thursday, March 21st. This film stars Erin Beute who was on “The Vampire Diaries” and Tanya Christiansen, a Sarasota based actress who was in “The Hate U Give”. “Mind The Gap”. is a psychological comedy about an off-Broadway actress whose life begins to unravel when her husband leaves her. It was made with the help of the Valencia Film Program Students from 2015 and alumni when they shot locally in Orlando. Last month, dozens of Valencia students from the 2018-19 year worked on a commercial for the Orlando Ballet’s April 2019 Premiere of Arcadian Broad’s Wonderland: Mad Tales of the Hatter. The ballet show follows the titular character, Mad Hatter, in his quest to save Alice from the Red Queen after having been banished from Wonderland and stranded in 1920s London. The commercial was filmed through Purple Anchor Films LLC, a multifaceted Production Company founded by Valencia Alumni Stephanie Pons and Freddie Aponte. Because of their dedication to this theater, Purple Anchor is now officially the Orlando Ballet’s exclusive partner in Commercial and Video work. This whimsical, colorful, and technically matchless project couldn't have been completed without the hard work of a dedicated group of filmmakers. Follow the Orlando Ballet’s website here for more info on this performance. Also, checkout this project’s behind-the-scenes time lapse video here. 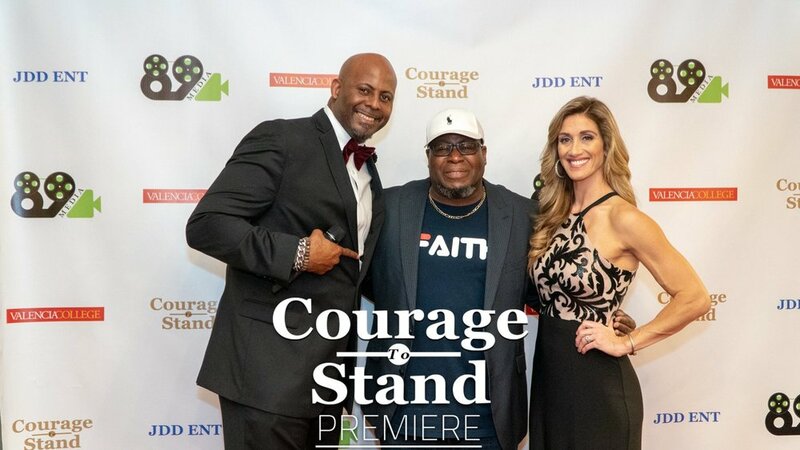 On February 17th, over 450 people made their way to the AMC Altamonte Springs Theater to watch the Valencia and 89 Media Produced short film "Courage to Stand." Courage to Stand was filmed last Spring with the 2017-18 Film Class on Valencia Campus. Over thirty students and alumni worked on the film, including 2016-17 alumnus Ed Love, who produced the Faith-Based Film. The story centers on Bryan, a young college student taking a class on Evolutionary Sciences with an intimidating professor who challenges his Christian faith. A champion for the importance of Apologetics, Courage to Stand will make you ask not only what you believe, but why you believe it. Spring semester is here! That means program is gearing up with awesome classes and more productions. For the second year in a row alumnus and local Sound Mixer Harryson Thevenin has taught over fifty students each semester the secrets to capturing “intelligible audio.” Cinematographer, Paul Mayne teaches the Art of Cinematography where students are immersed in the advanced concepts of camera and lighting. Over twenty students from the 2018-19 class participated in the short film titled Fragile Like Concrete; Written and Directed by Filmmaker Travis Hadley. This film was shot by Valencia Alumnus Stephanie Pons. A drama centered around a drug addict, Peter, and his quest to seek revenge on those who attacked him. With the assistance of his childhood friend, Titus, Pete forges a plan of vengeance. However, unresolved issues between the two bubble to the surface. For more information on this tear-jerking short, visit its Facebook and IMDb pages. Our students participated in a short film titled Seed Money, Directed by Bruce Wood. A retelling of Aesop’s Fables. "Seed Money," is a short film about a stock car racer who struggles to save his farm after a foolish decision lands him in jail. The 23rd Annual Valencia Film Celebration experienced two amazing nights in February 2018 when each night reached Sold Out status. The Celebration was a chance for students to raise funds for their projects by showcasing Valencia student filmed shorts and Valencia Produced Features, such as Frank vs. God and Mind The Gap. The 2017-2018 Class was able to raise over $3,000 in funds for their projects. These projects are scheduled to premiere in our 24th Annual Valencia Film Celebration on April 13th, 2019. For more information, check out our website here. W.A.S.P - A Wartime Experiment in WoManpower, produced by The Valencia Film Program and Rachel Becker Wright, won the coveted Audience Choice Award for Best Documentary at the 2018 Tallahassee Film Festival. The Jon Anderson directed film showcases the incredible history of the brave woman pilots who served during World War II. For more information and to view the trailer, visit the W.A.S.P. Facebook page or the W.A.S.P. website.